Just like their non-domesticated counterparts, pet rats are known to be durable, hardy creatures, and many go on to live long, healthy lives without having a single major health problem. Even so, rat owners would do well to know what those potential health concerns are, as there are plenty of conditions pet rats are prone to. Seeing the initial warning signs of illness can prevent their health from deteriorating further, which is why rat owners should learn them to ensure they are properly fulfilling their responsibility to their animal. The guide below should provide a wide enough net for pet owners to learn from regarding common health concerns in rats. For starters, rat owners must learn their pet’s typical pattern of behavior since anything outside that can be the earliest sign of a health concern. For instance, if one of several rats often doesn’t participate in group play, appears lethargic, or demonstrates aggression toward other rats, owners should be concerned. They should also be concerned if a rat isn’t eating, alert, or doesn’t care about treats. As well, rats should have a sleek, smooth coat, and if one is neither of those things, this could indicate a problem. Any breathing problems can indicate respiratory distress, which could cause permanent damage to a rat’s respiratory tract if untreated. Most rats carry mycoplasma, an organism that dwells in their respiratory system. 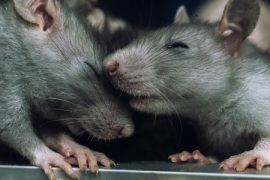 Usually dormant and not harmful in many cases, some pet rats are susceptible to a mycoplasma infection, usually manifesting in young rats as prolonged bouts of sneezing due to bacterial infection. This could escalate into other infections like pneumonia, bronchitis, or lung abscesses, so initial treatment is crucial. Often, sneezing is only concerning if it’s prolonged or recurring. Even though sneezing should never be ignored, it may not necessarily indicate a critical problem. In rats, there are occasions when mites cause health issues, such as extreme pruritus (or itchiness). This leads to scabs and skin lesions due to constant scratching. Oftentimes, mite treatment for rats involves a pesticide called Ivermectin, which a veterinarian must prescribe. To confirm a diagnosis, the vet can perform a skin scrape for further examination. Skin scabs can also have other causes, such as dietary problems or food allergies, the latter of which may be due to food that contains artificial additives or coloring agents. Deep enough scratches may call for antibiotics specialized for rodents and even a small Manuka honey wrap, but this is up to your veterinarian. A healthy rat’s eyes and nose should be free of discharge and clean. When rat owners find red discharge coming from their pet’s nose or eyes, it probably looks scary, but what they’re seeing isn’t blood. A rat’s mucus membranes contain a pigment called “porphyrin,” which can indicate illness, but it can also indicate stress. If you remain unsure, look for any other signs of illness or see if the discharge persists for longer than three days before heading to the vet.